In all promotions created with Easypromos the administrator has the chance to obtain the email of participants. This list of participants can be downloaded in an Excel file. For convenience, with the Premium and White Label versions of Easypromos, you can sync and import the data of registered users to a MailChimp emails list. Which actions can be carried out? 1. Synchronize and import participant emails automatically to any Mailchimp list. 2. Manually import participant emails from the promotion to the Mailchimp list you wish. 3. Match the entry form fields of the promotion with the fields in the Mailchimp list. 4. Make it a condition for importing to a Mailchimp list that the participant has ticked a checkbox in the entry form (for example the checkbox where the users give their consent to be included in an emailing list). 5. 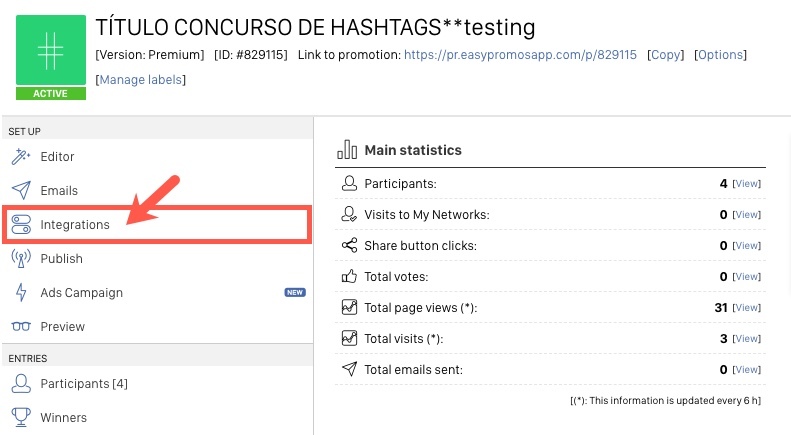 Put a Mailchimp tag on all the participants of the promotion that are imported to the selected list. 6. Indicate which group/interest of a subscriber list the promotion participants should be sent to. Important: In order to import the emails of participants to your MailChimp email lists, you should activate the “Email” field of the users’ registration form so that users can enter their email address when registering for the promotion. To begin, the administrator should have an active MailChimp account, as well as an email list already created. The emails of all the users who have participated in the promotion will be imported to this list. 3. You will now reach the Mailchimp configuration page where the first step is to enter the Mailchimp Api key. Note: To obtain the API, you must first have an active MailChimp account. You can then find your API by accessing your account settings. Here we explain how to obtain the API. 4. Once the API key has been saved, a pop-up with your Mailchimp lists will open. Select the list you want to import the promotion participants to. 6. When all of the fields of the promotion’s entry form have been linked with the Mailchimp list, the import will be activated automatically. This means that the application will automatically synchronize the user emails with the Mailchimp list as they register in the promotion (the import may take up to 10 minutes). Select the consent checkbox from the promotion: This option lets you select the checkbox from the promotion’s entry form where you ask users for their consent to contact them further. If you select a checkbox here, the application will only sync the users that have ticked the checkbox. Tag the subscribers with this label: This option allows you to add a tag to all the users that are imported to the list from the promotion. You can use this tag to organize the users in the list in Mailchimp. “Import now” button: This button lets you sync the promotion users with the Mailchimp list at a certain time, for example if the integration has been disabled.